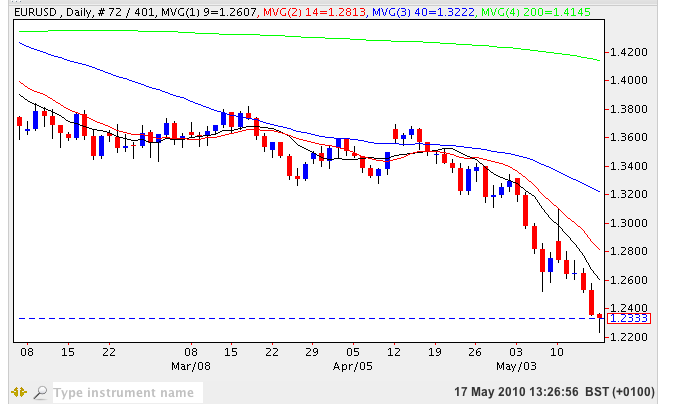 The euro vs dollar continued its downwards path on Friday ending the trading week with a wide spread down candle as it accelerated through the potential support at USD1.25 and now looks set to test the USD1.2250 region in the short term and USD1.20 in the longer term. Given that we have now broken through potential support in the USD1.25 area the longer term outlook remains heavily bearish with USD1.18 the next likely pause point for its continued slide lower. This price level currently combines with the 200 month moving average and should this fail then parity could beckon once again. As far as short term trading no the daily chart is concerned any pullback from the downward’s trend should be seen as further selling opportunities to take advantage of the longer term trend lower. With no fundamental news on the economic calendar for Europe today and only relatively minor releases in the US, aside from the TIC data, expect the price action to remain fairly desultory. The only caveat is loose talk from EU officials & rumours such as the German government is said to be once again printing deutschmarks! !